The University of Leicester started their second dig of the Grey Friars site on the 1st July 2013. 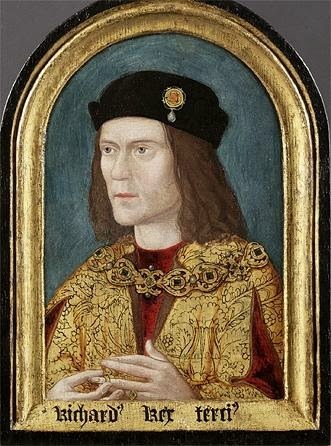 They had a month to excavate the area around the grave site of Richard III, and investigate further the other burial sites which they had located in the previous dig. The team were really helpful, answering questions from all the members of the public who arrived daily to take a look at the work from the viewing platform. They must have got really bored with being asked the same questions over and over, particularly as most of the questions involved the previous grave site dig and discovery of Richard III, but they always answered with a smile - despite working in the extreme heat of the unusually hot summer we have had this year! They also let people examine some of the finds, like the medieval floor tiles I am holding on the photo below. Also, there were old maps of the area and photographs to look at. It was certainly very interesting and informative to visit the site at this time and watch the team hard at work. Original grave site of King Richard III, a tarpaulin marks the spot where his remains were found. All photos on this blog are my own.